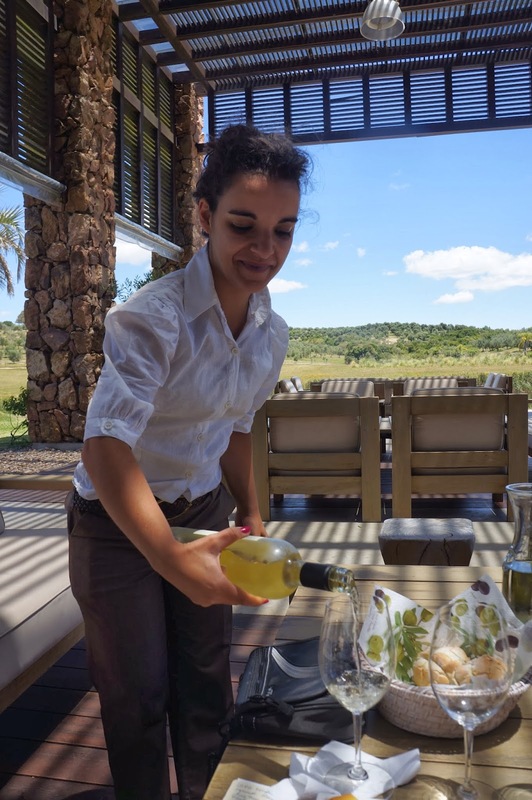 From Punta del Este on one of our last days in Uruguay, we went to the olive groves of Colinas de Garzon. This is the first brand of extra virgin olive oil produced in Uruguay that has received international awards and the grounds are gorgeous! The tourist experience here is well designed, with a concentration on education. First, we watched a movie about the evolution and spread of olive trees around the world. Olive trees originated in Syria. Oil was popular and made into perfumes. The crop then spread to Greece. From there, the trees were taken to Italy, and then Spain. Finally, the olive was transported to Mexico, and then California where trees were planted at missions. Apparently Uruguay is a great place for producing olive oil because olive trees grow well here. The soil is sandy and copious amounts of rain water can filter through to the roots of the plants. The harvest season is from April to June depending on the maturation of the olives and the fruit is gathered through a technique they call "milking." Workers run their hands over the branches, gently pulling away the olives. Here's a look at the tanks where the oil is processed. The oil settles in these tanks, is filtered again, and kept cool. The oil can rest in steel for four years where nitrogen is slowly collected and interacts with the product. The oil is constantly analyzed for acidity. Oil with 0.2 acidity is perfect. This is the quality of oil we tasted. The world standard for acidity is 0.5. Our guide suggests that cooks buy smaller bottles of olive oil and that once it is opened, the oil should be used within two weeks. Who knew? After a tour of the facilities, it was time for a ride on the tractor to see the grounds! The grapes were first planted on the grounds 10 years ago and the production yields about 2,000 tons of oil each season. They also grow almonds here but our guide said it is not as simple of a venture as the olives. Next up: olive oil tasting and lunch! When tasting olive oil, you are supposed to cup the dish in your hand to heat it up. Then, after smelling the oil, take a small sip and move it from side to side in your mouth. Breathe in and "shhhhh" through your teeth to feel the spiciness. Our fantastic guide explained all of this as we tasted three types: Monovarietal (intense yellow with green hues, herbaceous aroma and hints of tomato leaves and artichoke), Bivarietal (pure yellow and mild fruity aroma, delicate smell of clover, soft but with character), and the Trivarietal (deep golden and intense fruity aroma, subtle clean smell from fresh olives). This trip really was so special. James selected activities that he knew I'd love and I was so thankful to experience new things such as a cooking class, olive oil tasting, and one-on-one time with a sommelier. Uruguay is by far one of my favorite destinations and I cannot wait to return to the rolling country side and wide, powerful river.